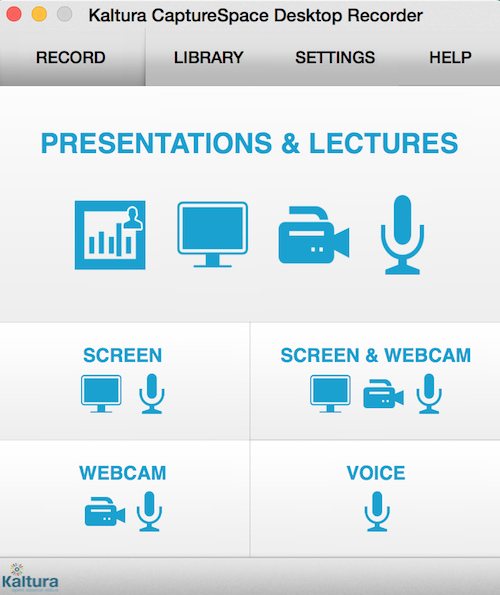 CaptureSpace is a screen, webcam, and microphone recording tool available for use by UW institution instructors, staff, and students. Recorded media can be uploaded to the user's campus MediaSpace instance directly after creation. This document provides a link to Kaltura's CaptureSpace user guide and has videos to help get started using the tool. CaptureSpace is comparable to other screen capture software, though may not have equivalent capabilities. It is intended to serve as a light-weight tool that is simple to use. Login to your campus MediaSpace or D2L instance, as the ability to launch CaptureSpace may be available via either or both application interfaces. Click the Add New button and select CaptureSpace. A new window will open prompting you to download the appropriate version for your machine. Click the Download for Windows or Download for Mac button. Your browser will download the appropriate installer. Locate the installer and double-click it to install CaptureSpace. Return to your campus MediaSpace or D2L instance and select Add New and select CaptureSpace. The Launch Application window will appear to verify that you want to open CaptureSpace Lite. The Kaltura CaptureSpace Desktop Recorder tool should be highlighted. Click OK.
CaptureSpace cannot record system audio - for example the audio played from an application you are demoing or a the audio from a video or music clip you are playing. It can only record audio from your microphone. Thus it can record audio being played from your speakers but the sound quality will be significantly reduced compared to directly recording system audio. If you need to record system audio we recommend you consider purchasing a license for a more powerful screen capture tool. Longer recordings tend to encounter more frequent technical issues. If you need to make longer recordings we recommend you consider using a more powerful screen capture tool. In the Settings tab check to see what you are using for the Camera Recording Quality and Screen Recording Quality. Using smaller sizes (480p for the camera and 720p for the screen) will result in smaller file sizes and quicker uploads. Make sure you have enough free disk space on your computer before you start your recording. A 1 minute recording at 480p for the camera and 720p for the screen is approximately 13.5 MB. A 1 minute recording at 720p for the camera and 1080p for the screen is approximately 17 MB. For documentation and more "how to" instructions, see the Kaltura CaptureSpace User Guide.